This paper starts its analytical endeavour by basically asking how management control can contribute to person’s innovative behavior at the workplace. However, in doing so, the paper takes a hitherto rather unusual perspective. By defining innovative behavior as a kind of ‘desired deviance’, it relates to a ‘dark side perspective’ on management control. In particular, by introducing Merton’s anomie theory, the paper explores under which conditions the multiple forms of control proposed by the objects-of-control framework are likely to produce desirable and undesirable deviant behaviors. 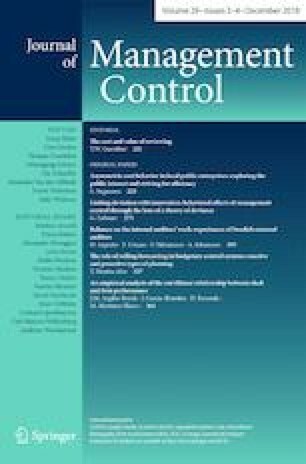 The findings inter alia show how actual ‘dysfunctionalities’ of management control can create precisely the conditions for producing innovative behavior. However, at the same time, they demonstrate that same conditions can also lead to frustration and withdrawal and thus produce rather undesirable behavioral consequences. In this way, the paper calls for deeper elaboration of the dark side effects of management control.